The birth of Tibet’s immortal yogi and saint Lama Tsongkhapa had been prophesised by Buddha Shakyamuni. The Buddhas of Wisdom, Compassion and Skilful Means (Manjushri, Avalokiteshvara, Vajrapani) incarnated in this divine child. 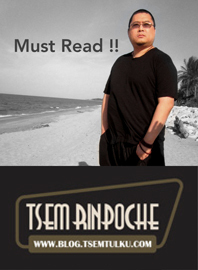 By his genius, his example of perfect balance of study and practice, his utter humility and boundless energy, he restored the holy Buddhadharma to its original purity and caused it to spread like a wildfire all over Tibet, Mongolia, China and India. Already practising the most profound tantric methods as a five-year-old, having been given his ordination vows by H.H. the 4th Karmapa, Je Tsongkhapa went on to study at the feet of no less than forty-five Gurus of all existing traditions. After an eight-year retreat, eating only one seed of a tree per day and offering 3.5 million prostrations and 1.5 million mandalas, many deities appeard to him directly and he remained in constant communion with Lord Manjushri for the rest of his life. Vajrayogini advised him to use the colour yellow for his teaching hat and the lineage that originated with him, the Gelugpa school, has often been called “Yellow-Hat School’ for that reason. Lord Tsongkhapa founded the three main monasteries of Gaden, Drepung and Sera whose many attained Masters uphold his enlightened tradition and share it with the world. He is the author of many texts unsurpassed to this day in depth and clarity, most famously his work “The Stages on the Path to Enlightenment”. Hailed as the second Buddha by contemporary Buddhist masters of his time, Lama Tsongkhapa comes from the mystical land of snows, Tibet. He is an incomparable pure monk, scholar and great teacher to thousands then and millions now. This simple monk has become a limitless treasure trove of love, wisdom and compassion. He is an ideal spiritual inspiration for everyone throughout the ages. Some look upon him for simple career advancement and some for a guide on a spiritual path. It simply doesn’t matter, as Lama Tsongkhapa grants wealth, business and career to the practical minded. He thus allows us to look deeper into spirituality with minds freer off mundane matters. Having Lama Tsongkhapa’s image has the immense benefit of harmonizing the energy wherever his image is placed. A direct result of having him in your home would be stabilizing wealth and happiness. Essentials of food, money, shelter and clothing will cease to be a problem. 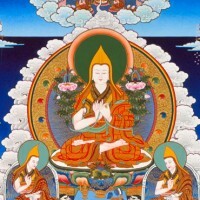 Lama Tsongkhapa’s image is well known to have a calming effect on aggressive minds and those with destructive emotions. Making offerings to him and doing his meditations and practice allow us to cultivate the inner qualities of wisdom, compassion and inner strength. This practice’s other benefits are destroying all problems and obstacles. This is displayed with the flaming sword of wisdom on a lotus on his right. The Book of Dharma on the left lotus indicates by taking refuge in him, one can attain the higher wisdom of achieving true inner peace, tranquility and ultimately, Enlightenment. Je Tsongkhapa’s Guru Yoga meditation (Gaden Lhagyama) is open to all, easy and pleasant to do, yet infinitely profound. Healing of depression, restlessness and sickness, protection from negative energies, enhancement of intelligence and clarity, deep joy and peace are experienced by those who practice it.